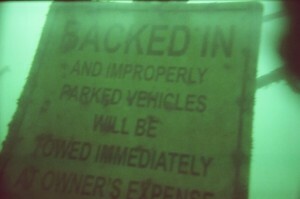 My Jeep has been out of commission for a while. The engine blew a piston ring, and it was running really poorly. A couple weeks ago, I found someone selling a working engine for my Jeep. I had a buddy of mine install it, and get my Jeep up and running again. After getting the new engine installed, Allyson and I thought it would be a fun to put it through its paces and try it out on a trail. We posted on a Facebook group, looking for a few other people to go with us. Pretty soon we had a small group consisting of, ourselves, someone new to off-roading, and another person who just had their radiator hoses replaced. 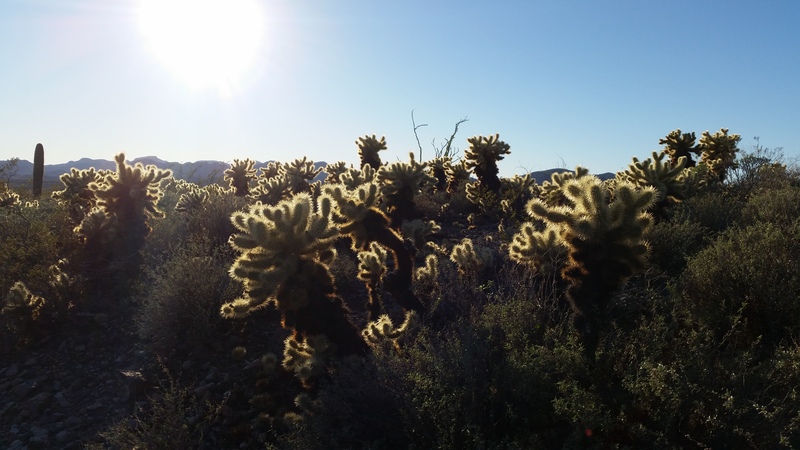 The trail starts just outside the city of Tonopah, which is about an hour west of Phoenix. 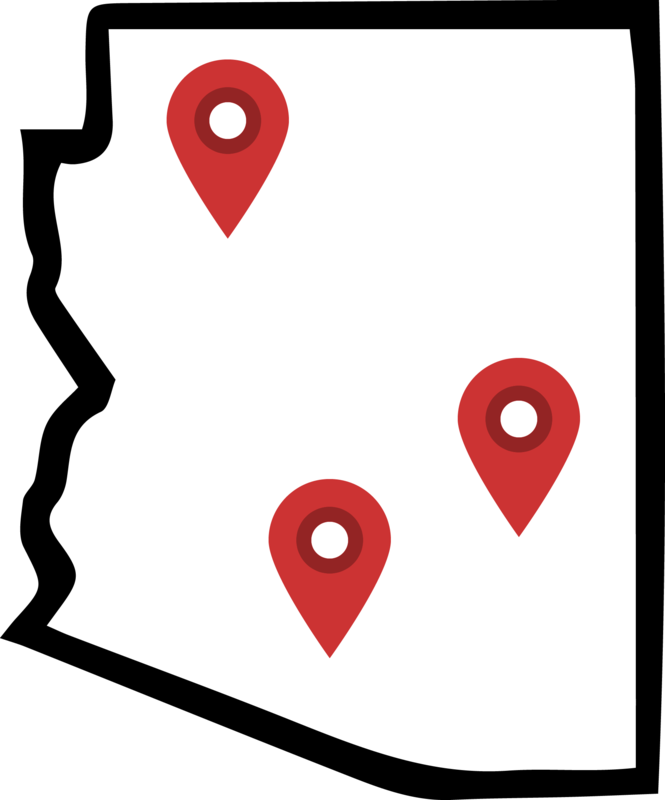 The trail isn’t very well marked from the paved road, so it’s best to use a GPS to help locate the trail. The staging area is right at the beginning of the trail next to a bulletin board. It is a good idea to air down here. 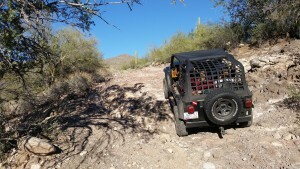 After the staging area, we followed a few fairly flat and easy trails. Even though the trails were flat, they were by no means boring. 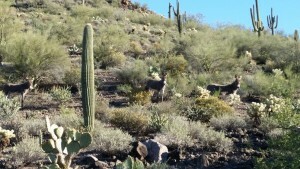 We were presented with magnificent views of the mountain and surrounding desert! While on the west side of the mountain, it’s a good idea to stop and look around on the ground. Many, really interesting rocks can be found in this area. It’s a great area for rock hounders. Once got about 1/4 of the way through the trail, the nice easy flat path stopped. Instead, we were facing a relatively deep and steep wash. After surveying the wash, we decided that the only way across, was by going down into the wash, and coming out the other side. 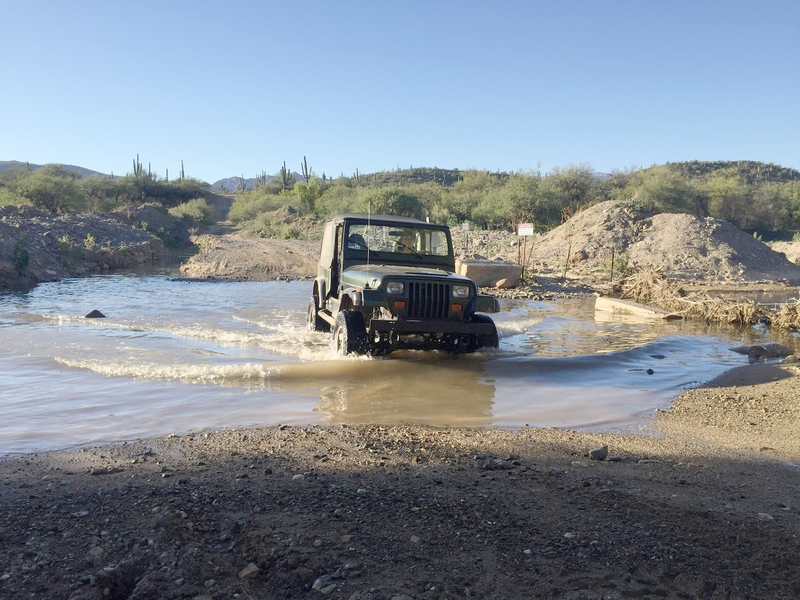 This was a bit of a challenge for our new Jeeper, but everyone was able to make it in and out of the wash with no problem. The southern half of the trail becomes a bit rougher. This part of the trail appears to get very little use. 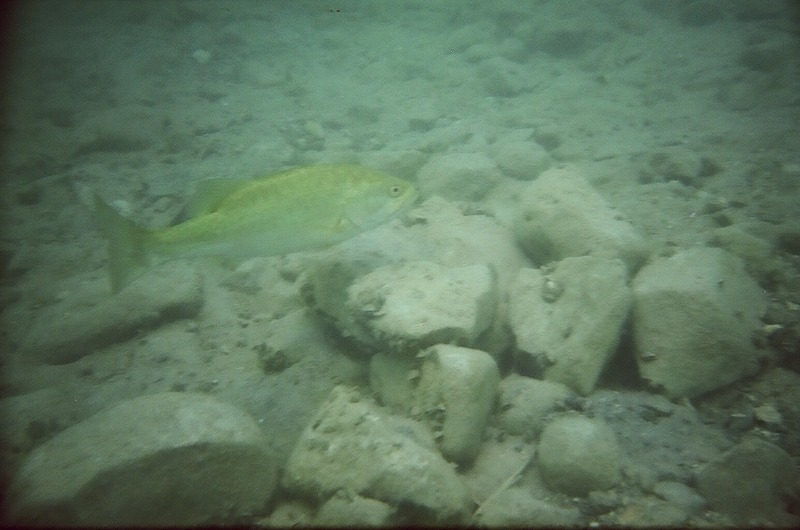 It’s not terribly difficult, but we did have to cross a few small, shallow washes. 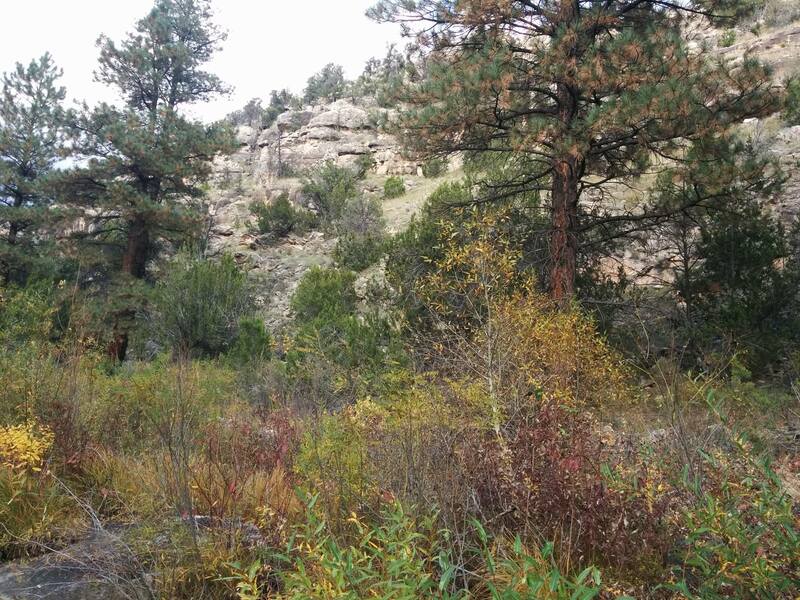 This part of the trail is a great place to get beautiful views of the mountain. The eastern side of the trail presented us with a new challenge. 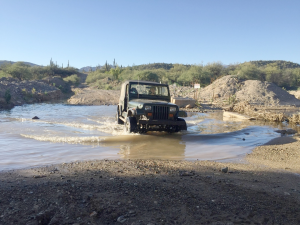 The two Jeep Wranglers in our group were able to pass a medium sized wash, but the wash was too narrow for the Grand Cherokee with our new off-roader in it. 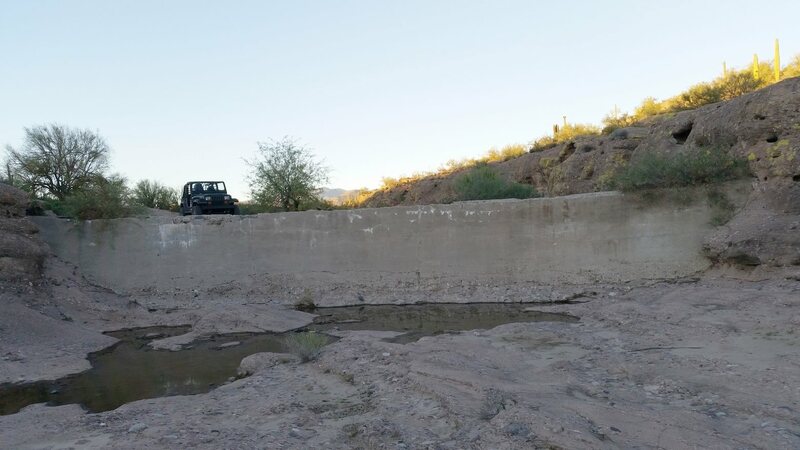 When she tried to cross the wash, the front and back of her Jeep ended up touching either side of the wash and lifting her wheels off the ground. We had to stack a few rocks in front of her front wheels in order to get the Jeep across. She lost a little paint from her rear bumper in the process, but she made it across. The east side of the mountain also gave us a few opportunities for rock hounding. There weren’t as many interesting rocks as the west side, but we did find a few with some nice crystals on them. 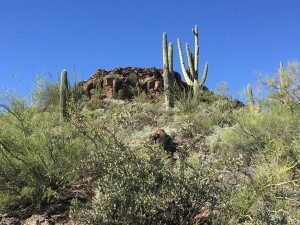 We finished off Saddle Mountain with a side trail that we spotted. It went up a hill to the west of us. A short drive up the hill, and we got a spectacular view of the mountain and the surrounding areas, just before sunset. At the bottom of the hill, we pulled off the trail to air up and have dinner. This trail was a lot of fun for both the beginner in our group, and those of us who were more experienced. 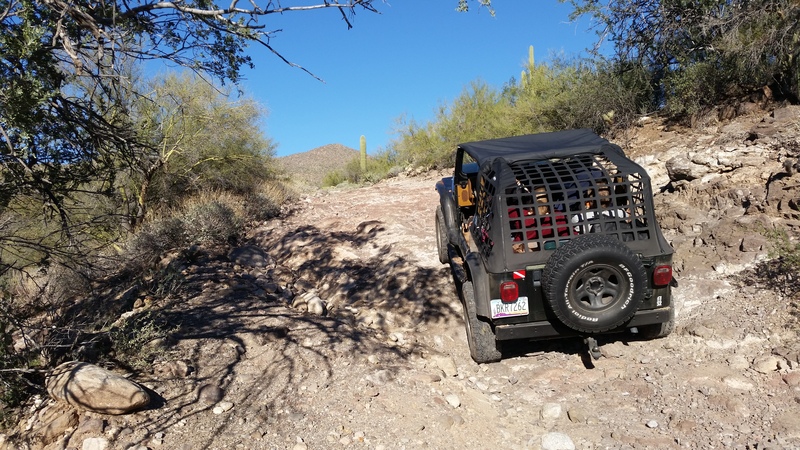 We would recommend this trail for almost anyone with a higher clearance vehicle. Watch the video below to see this adventure for yourself! This entry was posted in 4WD on January 26, 2017 by Brandon Lee. 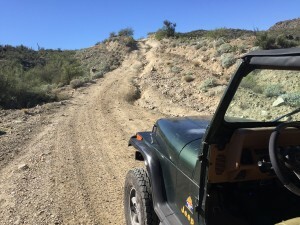 If you’re looking for a fun, but not too difficult trail, the road to Fort Tule is ideal. Allyson and I had the fortune of having my parents join us on this trail. Allyson had her 25th birthday and instead of having a birthday dinner at a restaurant, she decided she’d rather have a picnic during a Jeep ride. We met my parents, who drove their Prius, at the staging area. Had some birthday cheesecake, and were headed off for the trail. The very first part of the trail is a super steep hill. 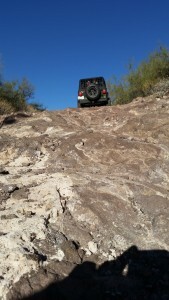 We put the Jeep in 4WD Low and had no trouble getting over the top of it. At the top, we spotted a really easy bypass, which we’d take on the return trip only because the sun was setting. The trail brings you up over a hill and soon you find yourself at a split in the road. 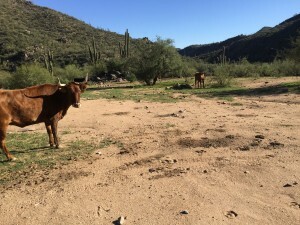 Go left, and you head toward the China Dam, or go right and you head toward Fort Tule. 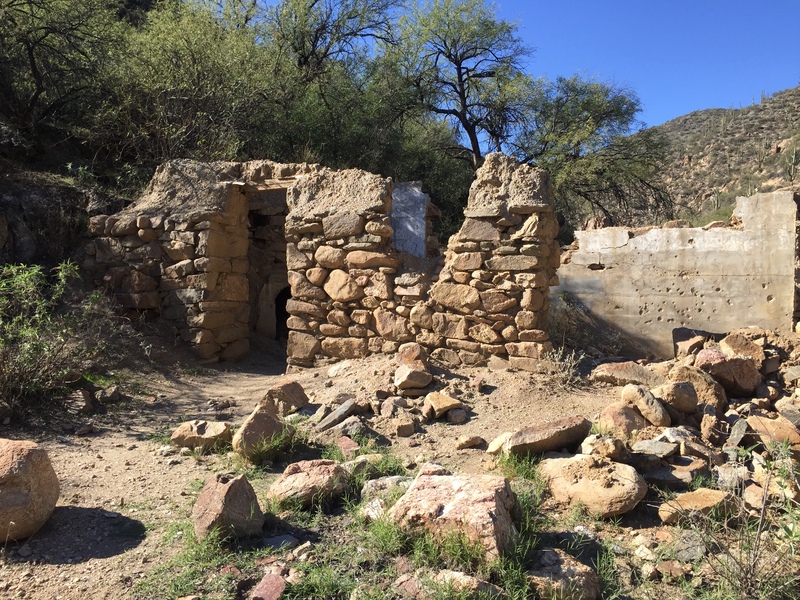 Even though we intended to go to the China Dam first, we read the map wrong and headed toward Fort Tule. The road descends down toward Humbug Creek. 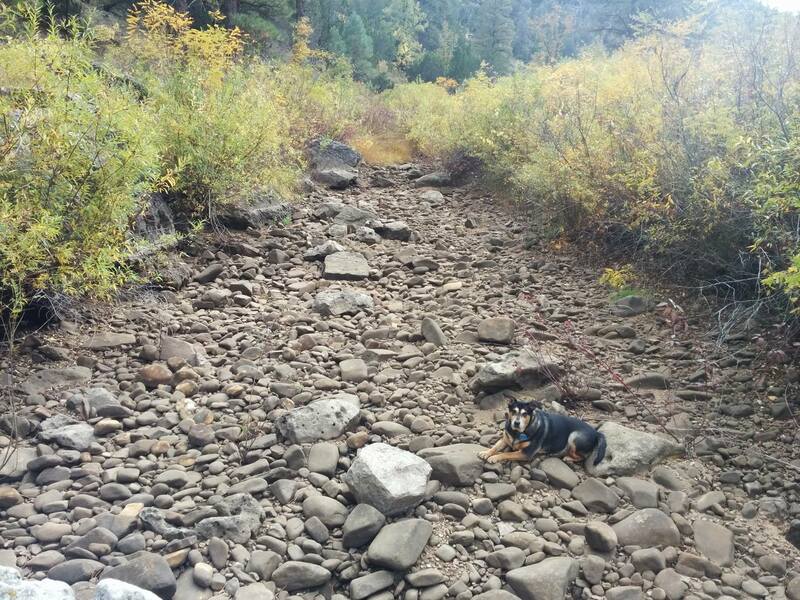 When we passed, the creek was dry, and we were able to drive right over it. 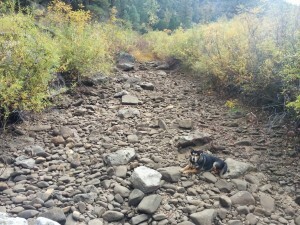 On the other side of the creek, we encountered a steep hill. My dad insisted on getting a photo of the Jeep climbing the hill, but it turned out to look a lot less steep in the photo than it was in real life. Not to worry though, he got a good photo a short ways down the trail. 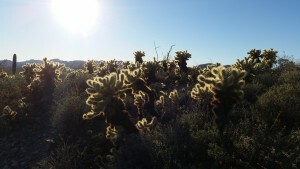 We rode the trail a ways, surrounded by Jumping Cholla on either side. 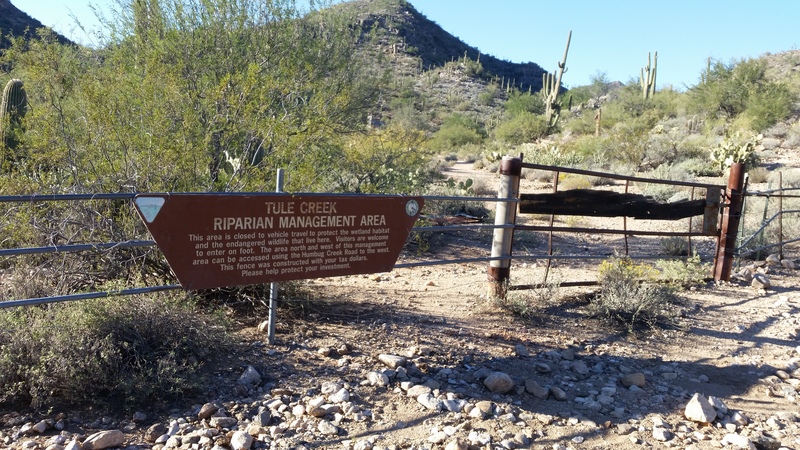 Finally we arrived at a sign that indicated we had arrived at the Tule Creek Riparian Area. 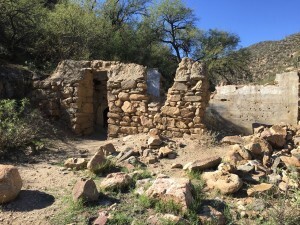 Since vehicles are not allowed in the preserve, we walked the last 300 or so feet to the house at Fort Tule. 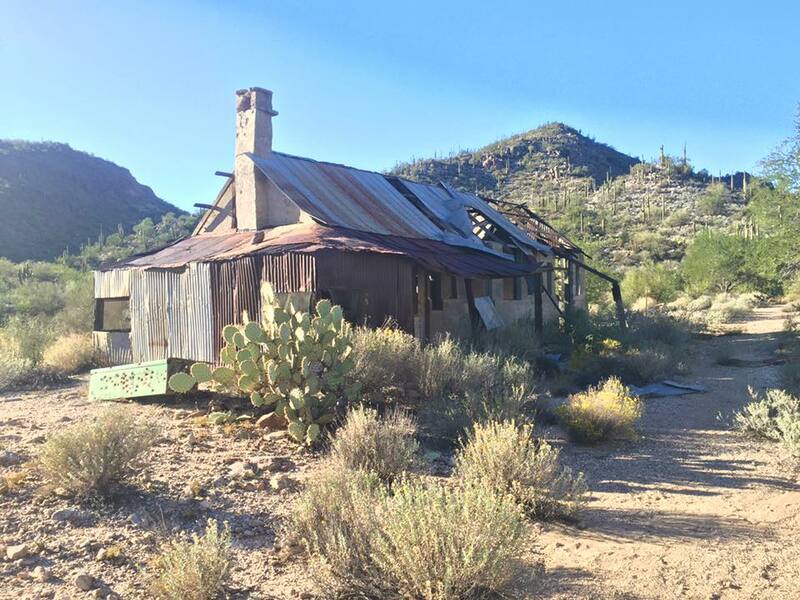 The house is an old miner’s house. According to my research, in 2007, a bad storm took off it’s roof. Despite the roof, the house is in very good condition, considering it’s age and lack of maintenance. 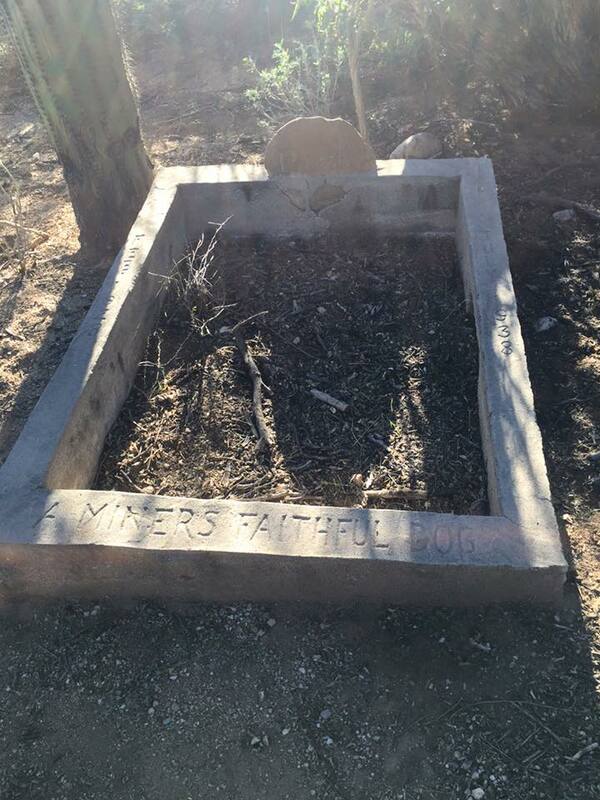 If you walk around the house, you may spot what appears to be a shed or a barn, and a grave for the miner’s dog. We headed back the way we came. 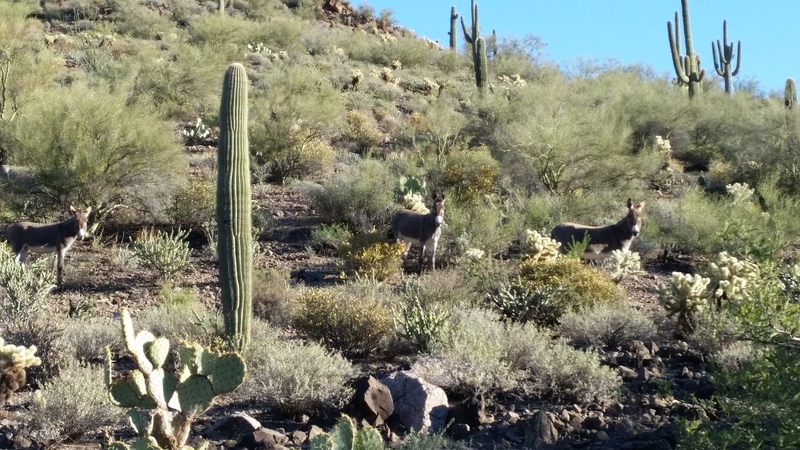 As we were leaving the riparian area, we spotted a group of five burros. 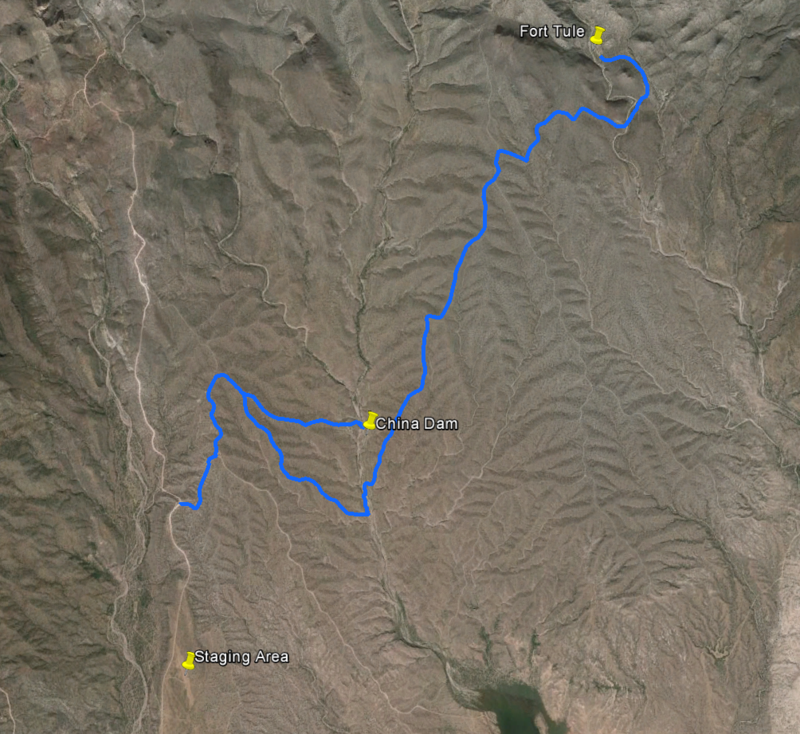 When we got back to the split in the road, we headed off toward the China Dam, like we first intended to do. The road there was similar to the road up to the fort. On the way we spotted a rare “crested” saguaro cactus. Scientists aren’t sure what causes the cresting, but some think it’s either a genetic mutation, or a lightning strike that causes it. The dam is only a short ways down the road. It only took us a few minutes to reach it from the split in the road. We parked on top of the dam and walked down to explore. 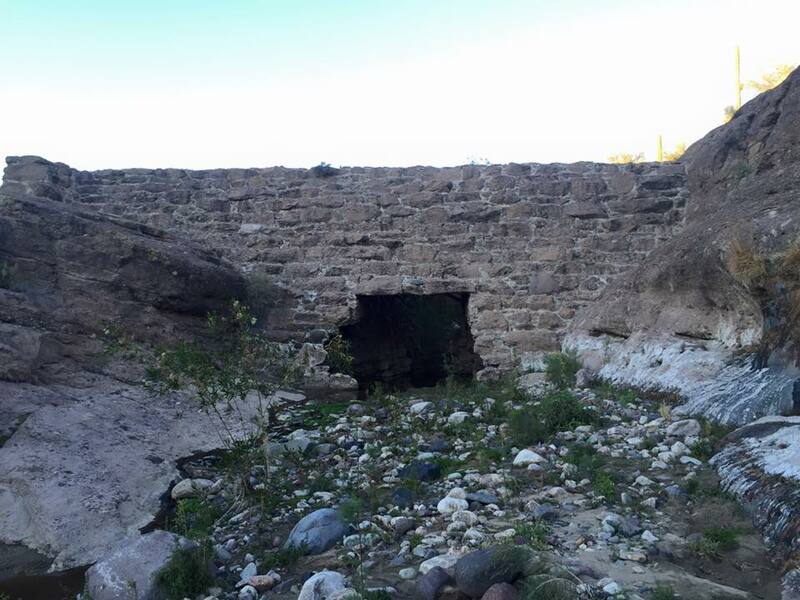 The dam was built by Chinese immigrants who were looking to mine gold. There are actually two dams. One concrete one, and a stone one as well. The stone one has a hole in it. The sun was setting, so we headed back to the Bradshaw Foothills Staging Area, where we cooked our dinner on our portable stove, and packed up to leave. This was a great trail. 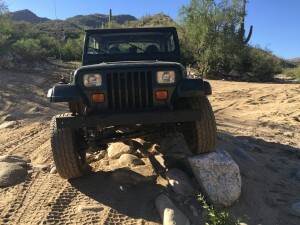 It will push a stock Jeep, but should be entirely passable in a stock vehicle. It allows for a lot of sight-seeing, and places to break. We didn’t see a single other vehicle on the trail. There were plenty at the staging area, but none on the trails. By the way, my parents sold everything they own, and now travel across the country house-sitting. We had the fortune to have them on our own adventure. 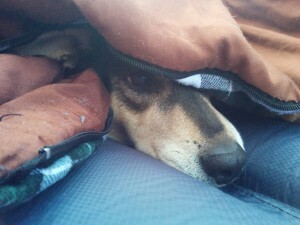 Check out their adventures at The Tails of Jeff and Charli. This entry was posted in 4WD and tagged 4WD, Bradshaw Foothills Staging Area, China Dam, Fort Tule, Jeep, Lake Pleasant on November 24, 2015 by Brandon Lee. 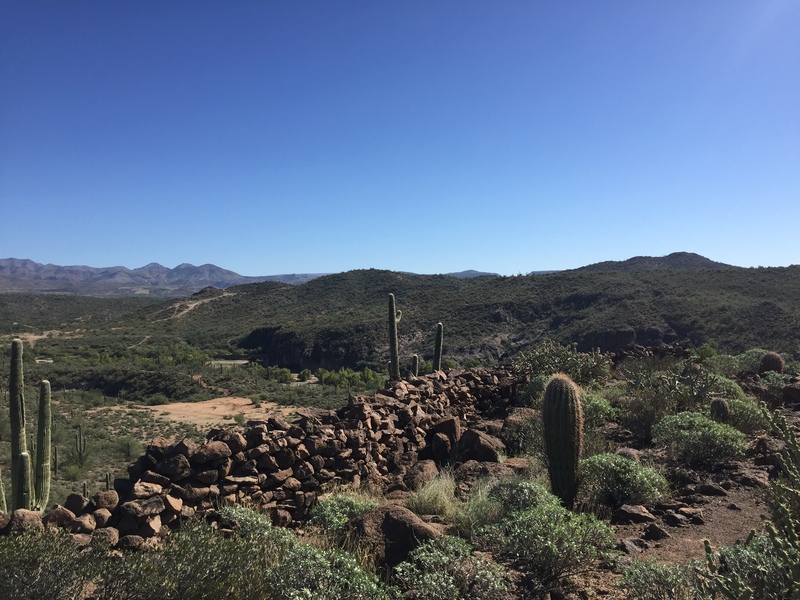 The trail to Tip Top Mine is a beautiful Arizona trail. 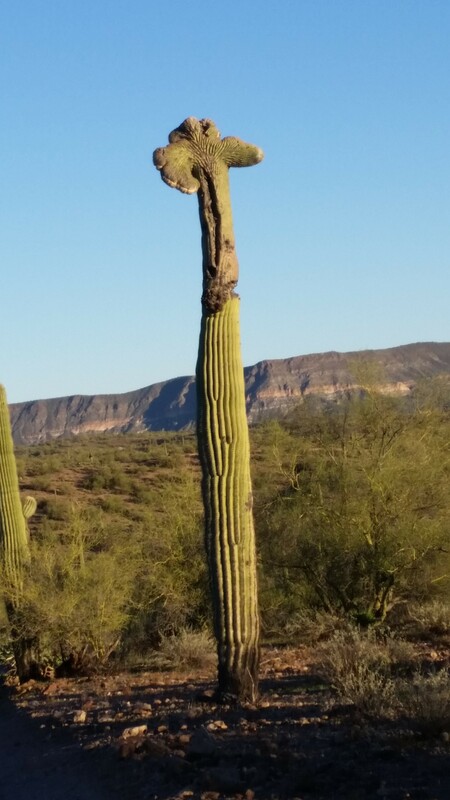 It’s long and bumpy, but offers some pretty amazing views of the Arizona desert and mountains. It is probably passable with most stock 4WD vehicles, but the last small stretch up to the mine might require something with a little bit of ground clearance. 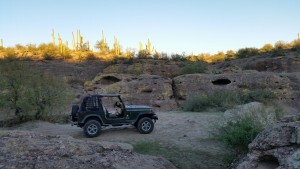 This trail was Allyson and my first time out in the Jeep. 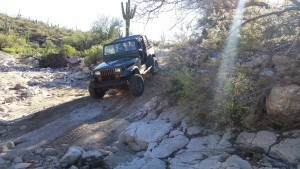 We picked this trail out of the “Arizona Backroads & 4-Wheel-Drive Trails” book written by Charles A. Wells and Matt Peterson. We picked this trail because of a nearby geocache we wanted to try. It was also a difficult enough trail that I could test the Jeep’s abilities (and my own as well), but not too difficult that I wouldn’t be able to complete most of it. 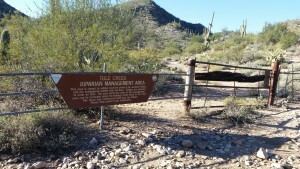 The trail starts at Table Mesa Road. This is a very popular road, and many areas around this road will be filled with Jeeps, ATVs, UTVs, and dirt bikes. It’s also a very popular area for shooters. There are a few designated areas for shooters to shoot their guns down a range. 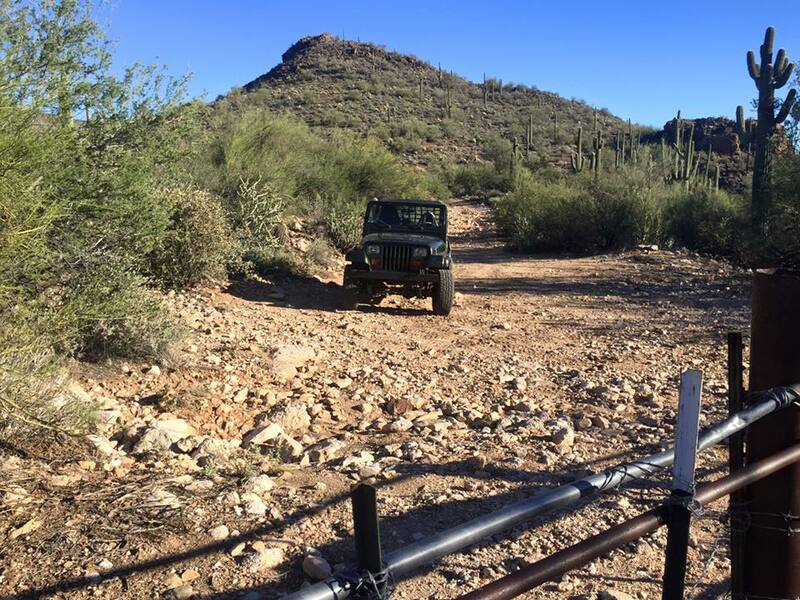 The parking/staging areas at the beginning of the trail require a State Trust permit, but the trail does not. 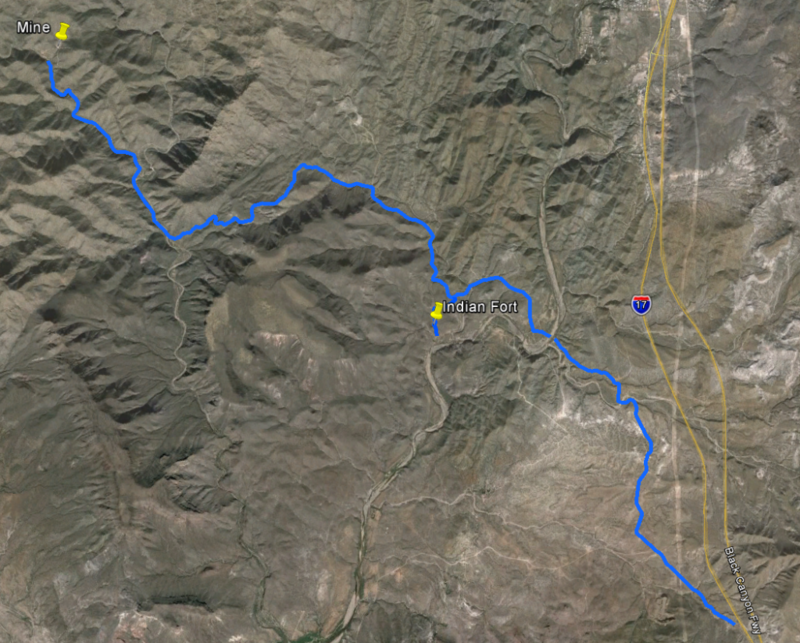 After a short drive, you will meet the Agua Fria river. 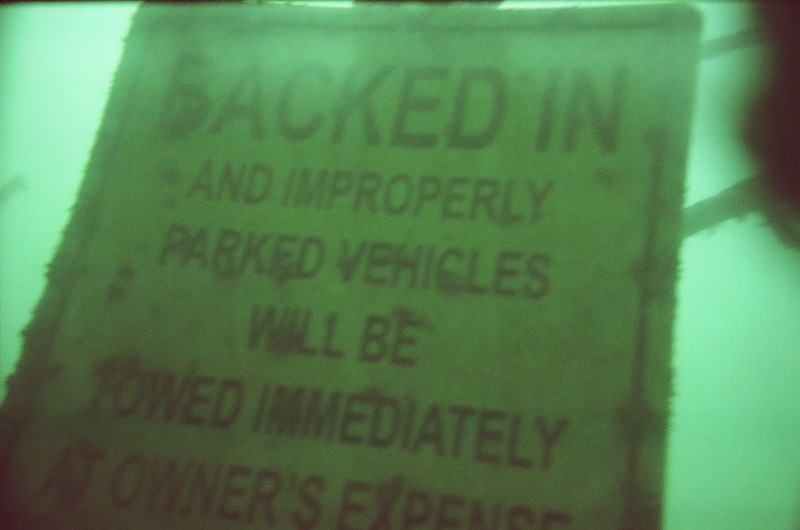 This is usually pretty shallow, and can be passed in most SUVs. I have heard that after heavy rainfall, a high clearance vehicle may be needed to pass. After the river, you will see fewer people. It is still a busy area, but some of them seem to be turned off by the river. From the river it is another little bit and you will end up at the turn off for the Indian fort. Turn left to head to the Indian fort. 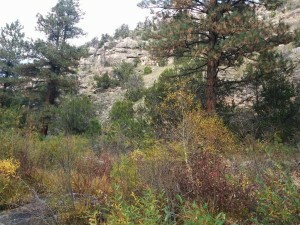 About halfway down the hill, you will see a large mesa to your right. On top is the Indian fort. There should be a small pull off to park. 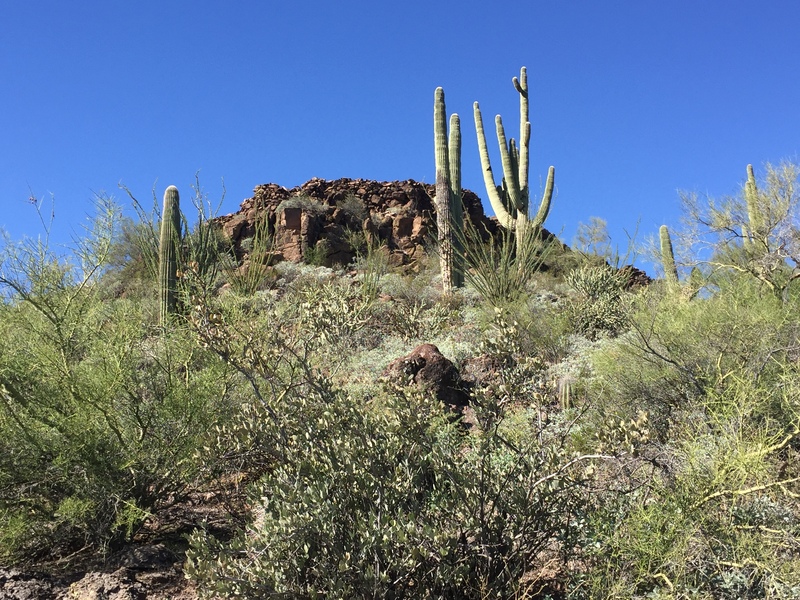 Get out and walk the trail up to the Indian fort. You will have to climb the rocks a little, but you will get an amazing view of the area from on top. After visiting the fort, head back to the road where you turned off to go to the fort. This time, stay right, and continue down the trail. 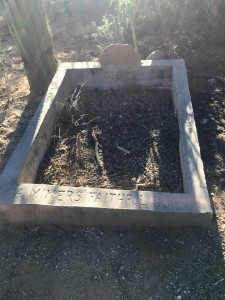 The trail will become less and less maintained as you continue on. This makes for a bumpy ride, but it’s still a lot of fun. At one point you will hit a high spot on the road that flattens out. This is a great place to take pictures. You can see for miles. From the high spot, most of the rest of the trail is downhill. It’s still pretty bumpy, but a good ride. You will hit an old wooden corral. Keep left on this trail. Watch for cows. They are everywhere around here. At the bottom of the hill, you will cross a wash. This wash is usually dry, but may have some water after a rain. After the wash is the hardest part, and the only part where a high clearance vehicle may be needed. There are a few steep rocky spots. After you get past them, its a pretty short distance to the mine. You will see a couple of crumbling stone buildings on your left. To your right, up the hill is the mine. There is a road that goes to the mine, but it can be pretty difficult to drive at times. Do not enter the mine. There is bad air in there. Have fun exploring the area. We stopped and had lunch here. Go back the way you came in. The trail continues further down the road. 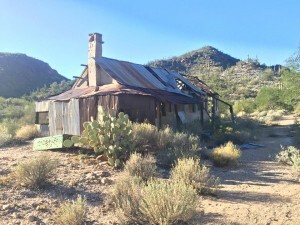 Some people passing by in UTVs said there was a ranch house down the road a bit further, but we didn’t explore that. 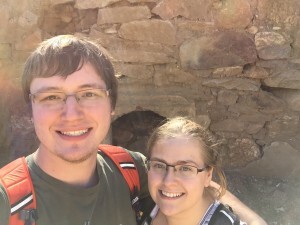 This was a great adventure for our first off-roading trip. A great place for beginners to try out their skills. This entry was posted in 4WD and tagged 4WD, BLM, Jeep, Tip Top Mine on November 9, 2015 by Brandon Lee. 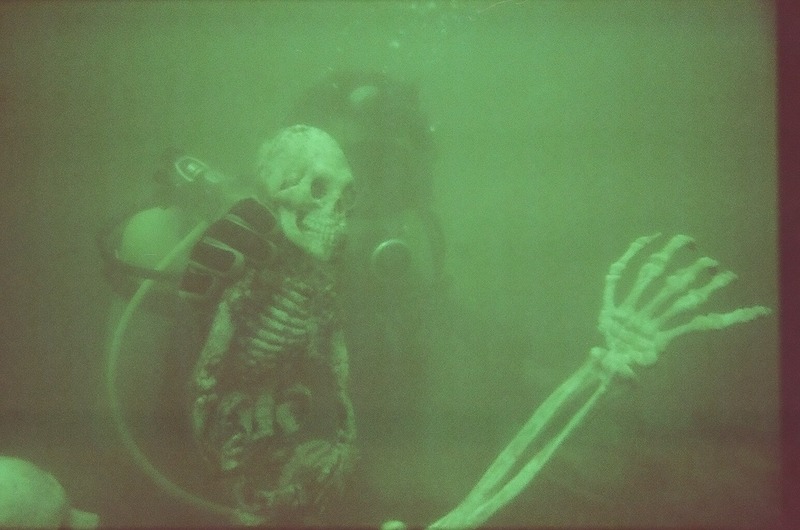 I wanted to share our favorite local dive spot. Almost any diver in the Phoenix area knows this location fairly well. 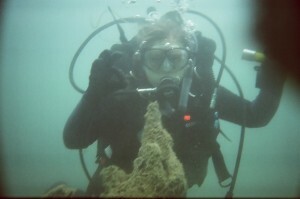 Many training dives happen here, as well as a lot of fun dives. 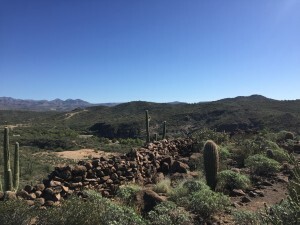 This spot is known as Vista Point, and it is on the East side of Lake Pleasant. 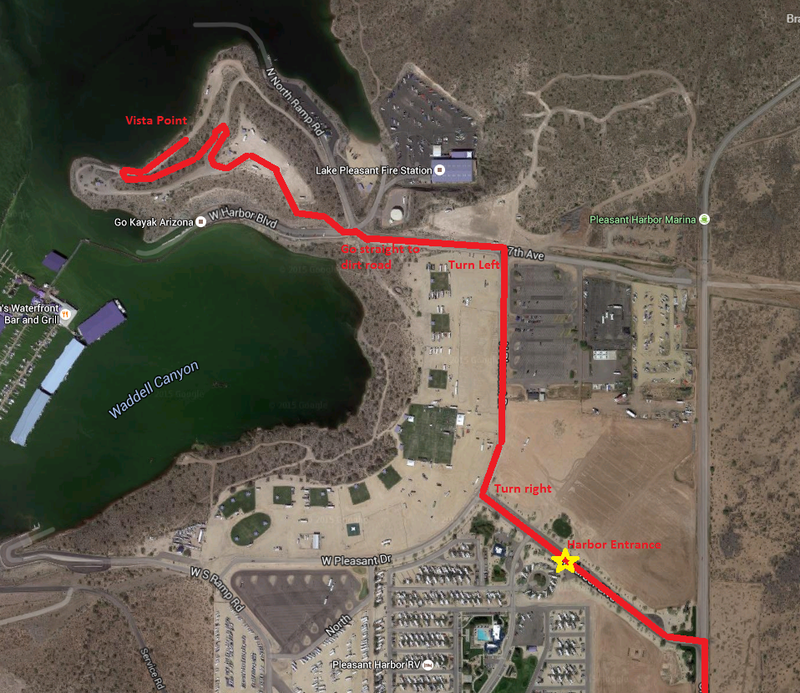 To get to Vista Point, you have to enter the park at Pleasant Harbor. There is a $6 fee, and it’s only for the Harbor. If you want to go to the rest of the regional park, you have to pay the county on the other side of the lake. After you enter, you will follow the road to the end, then turn right. Again, follow the road to the end, and turn left. This road will go a short ways before curving toward a boat ramp. Instead of following the curve, look straight ahead. There should be a parking lot, with a dirt road that comes off of it, with a sign for Vista point. Follow the dirt road up the fairly steep hill (a 2WD vehicle will make it, no problem), around and down. You should find yourself right by the water. Here’s a map I drew up to show the location. 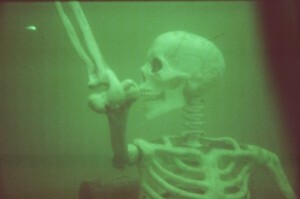 Every time we’ve been here, there have been at least a few other divers here. There is a very short staircase by the parking lot that gets you down the steepest part of the walk toward the water. You will have to carry your gear a distance, but that distance changes throughout the year. Lake Pleasant is a reservoir lake, and will change depending on the rainfall and the demand for water. Take a heading on your compass of 210 degrees from North. Follow this a ways, and when you get to a depth of 20 to 50 feet, you will come across a bunch of cool things. We’ve found road barricades, skeletons playing cards at a table, a grandfather clock, memorials to late divers, and a handful of other cool things. There is a bit of a dropoff here too. If you descend below this wall, you may find yourself beyond a basic open water depth (60 ft). Bring a flashlight with you down there, as it gets dark very quickly. Allyson and I haven’t been any further than the shallow depths of that wall. I hear there are plenty of other cool things that are around 80 to 100 feet. If you’d rather explore Vista Point from the comfort of your computer, I filmed the location with an underwater camera the last time we went. I cut out a lot of the swimming and tried to keep just the interesting parts. 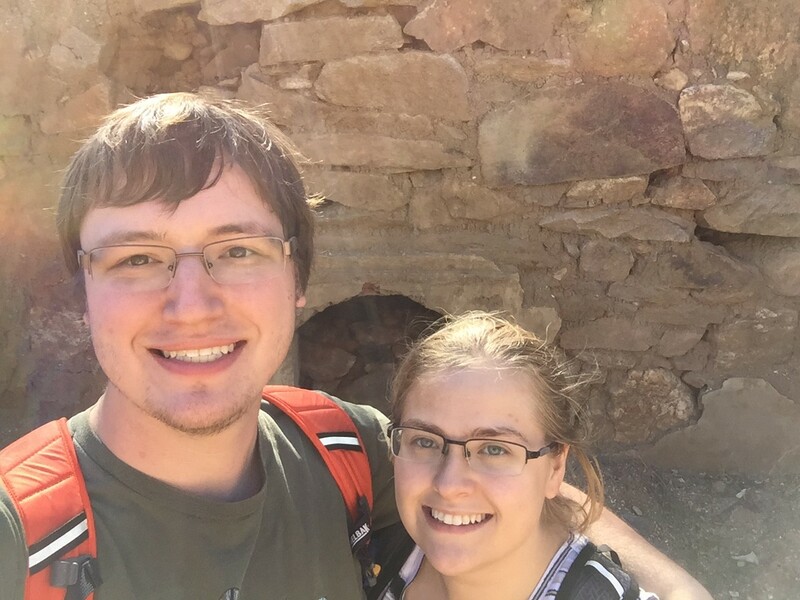 This entry was posted in SCUBA and tagged Lake Pleasant Regional Park, SCUBA, Vista Point on October 21, 2015 by Brandon Lee.